It cannot be over emphasised how important it is to have comfortable walking shoes or hiking boots when you're out walking. It can make a complete difference between enjoyment and despair and success or failure. 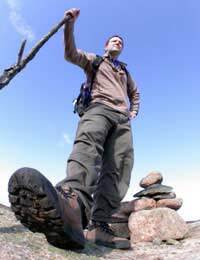 There are so many variables when out hiking that it's not simply a choice between hiking boots or walking shoes but whatever footwear you choose it's crucial that it's right for the 'job' and that it supports and protects your feet. Ultimately, to the seasoned walker, your feet should feel just as comfortable at the end of your walk as they do at the beginning. The wrong choice can lead to bruised and aching feet and, furthermore, could cut your walking trip short. Most walkers will try to choose the lightest possible walking shoe that suits their specific needs. However, the terrain and conditions e.g. protection from rocks, mud, water, heat and cold will also have a bearing on the type of footwear you'll tend to opt for. Even then, your feet are unique so you'll want to choose a pair of walking shoes that give you the correct support and cushioning which can vary from person to person. You should be able to twist and bend in your shoes so they need to be flexible to allow your foot to flex as you roll through a step from heel to toe. And, as walkers tend to strike the ground with their heel first, the heel part of the shoe should be relatively flat. The motion control type of hiking boot is probably the closest match to the traditional pair of hiking boot. They're the most rigid type of shoe and so they tend to be heavier than other types, although they're often more durable. They can particularly help people who have a tendency for overpronation. Pronation is a term to describe the slight inward rolling motion which the foot and ankle makes when taking a normal stride. In overpronation, the arch of the foot flattens which causes a lot of pressure and stress on the soft tissues of the foot but because motion control shoes tend to consist of a denser material on the sole where the inside of the foot is situated, it can help people who tend to overpronate. On the downside, they have a thicker heel which can make hiking seem more arduous than is experienced with certain other types of shoe. Stability walking tend to have more flexibility than a motion control shoe but still have a dual density midsole for support. They're more designed for people who may still have a slight propensity for overpronation but they're not as cumbersome, although they, too, have a thicker heel, so they're comfortable when hiking. Cushioned walking generally have the least support and the softest midsoles and they're extremely flexible. They are designed for those who do not overpronate or need extra support and people who have high arches often tend to choose this type of shoe for support when hiking. Once again, they come with a thick heel. Lightweight trainers are very similar in style to your traditional training shoe, only lighter. They're more often chosen by fast paced walking or for racing. When Would You Need Racing Shoes/Flats? Naturally used for racing, racing shoes and flats have a low heel, are highly flexible and extremely light. However, they are not durable and have little stability and cushioning, so they're not for regular walking. Lightweight hiking boots and trail walking shoes are more designed for day hiking and shorter trips. They often come with rugged soles and are designed to be comfortable, cushioned and breathable and to have many properties similar to a walking boot. However, they're not as heavy as a pair of boots and therefore don't provide quite the same level of support nor are they as durable but they are probably the best choice if you're carrying a backpack and/or crossing rough terrain. Some people walking sandals to any kind of boots for walking in hot weather/hot climates such as Greece. They require more care to be taken about foot placement and route-picking through rough scrub. They prevent feet overheating and swelling and can therefore help to reduce blistering. Although criticised for not providing ankle support, if worn regularly, they do lead to ankles becoming stronger and less prone twisting. Decent quality walking sandals ofr the same ankle support as walking shoes (but not as good as walking boots). The only downside is that on loose paths such as pumice they can fill with grit and become uncomfortable. Ultimately, the best thing to do when choosing a walking shoe is to seek advice from an outdoor shoe specialist. Hi, I am trying to find an excellent, all-purpose, all-terrain, everyday trainer foir 24/7 use. For - walking miles on tarmac, quite fast (needs durability, water resistance), over fields or grassy mountains (needs a bit of grip, but not chunks), occasionally hopping over rocks or stiles, or dancing all night (flexible with cushioning), and must be well padded around my ankles (for bad skin). Most trainers seem too specialised. I had a pair of Nike Dunk SB's for a year and loved them, but lacked water resistance and grip for outdoors. I also like the Free Runs, but they would slip on grass. Can you help? @Shocky. Without knowing the full details it's difficult to say. Have you tried the same walk with different footwear or using gel pads/inserts? Hi, my query is I live in spain and I try to get exercise by walking a couple of times a week. My problem is that after about 3 kilometres the balls of my feet especially the right one start to feel like they are burning and are quite painful, consequently I only manage about 4.5 or 5 kilometres. I am 68 yrs old and in reasonably good health and my podiatrist/chiropodist says I have good feet.The pain stops very quickly when I stop walking and take off my shoes and socks.I wear light walking /training shoes and wonder if I need To wear proper walking shoes or boots. I walk on mainly tarmac roads with a bit of rough ground. Any advice will be much appreciated. Regards Shocky. Something that’s worth mentioning is that the hiking boots should be waterproof. You’re unlikely to find that with shoes, but you’re probably not going to wear hiking shoes for longer walks. But the waterproof factor can save miles of misery down the line and leave you with more comfortable feet at the end of a day. You should point out the importance of breaking in a pair of boots. You shouldn't just buy them and set out on a 20 mile hike. Wear them a few times first, even if it's just for going for a walk in your neighbourhood, until they feel properly comfortable. Wear proper hiking socks when you're doing it, too. Fantastic info will benefit many hikers like me thanks! Good source of information. The passage on light weight hiking boots and how to avoid blisters was great.